Xkey 37: Like the Xkey, but longer. NAMM 2015: CME's 25-note, Apple-esque Xkey has been drawing admiring glances ever since it was announced, and the good news is that it plays almost as well as it looks. 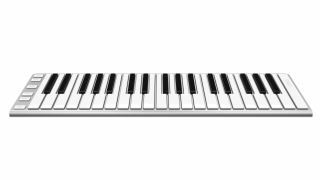 Now there's a larger version of the slimline MIDI keyboard on the way. The Xkey 37 was previewed last year, and adds an extra octave's worth of keys (there are, unsurprisingly, 37 of them) and a new Xport connector that expands the range of MIDI connectivity options. Using this, you get a standard 5-pin MIDI Out and sustain and expression pedal inputs, none of which are available on the original Xkey. Otherwise, the feature sets are very similar: the Xkey 37's keys support polyphonic aftertouch and the pitchbend and modulation buttons are pressure sensitive. Price and release date are still to be confirmed. Find out more on the CME website.